More than two months after a dramatic police crackdown on 17th Street, the impact is beginning to come into focus: Court records show many of the 75 who were arrested were jailed for days while they awaited arraignments. More than a quarter have yet to be charged despite being held in jail. Some homeless residents who’d stayed there for months or years moved to other neighborhoods; others have settled nearby. Until recently, 17th Street was San Diego’s skid row. Homeless San Diegans’ tents covered sidewalks on both sides of the street, and their belongings spilled onto the roadway. Then they disappeared. For a time, the area was eerily silent. The tents were gone. Once-packed streets were dormant. Police descended in September, arresting 75 people on 17th Street in order to clear the area for power-washing to combat a deadly hepatitis A outbreak that’s battered the homeless population. Another two dozen were cited. Nearly all were accused of misdemeanor crimes, including blocking the sidewalk with their belongings, settling in a tent or drug charges. More than two months later, the impact of the police crackdown is beginning to come into focus: Court records show many of the 75 who were arrested were jailed for days while they awaited arraignments. More than a quarter have yet to be charged despite being held in jail. In at least a few cases, prosecutors dropped charges that were the impetus for the 17th Street arrests but decided to pursue other cases against those arrested, like for earlier drug charges. Some who had stayed on 17th Street for months or even years moved to other neighborhoods. Others have settled in quieter corners nearby at night, hoping to avoid police. Many were temporarily pulled off the street at a substantial cost. The tab for the 17th Street arrests likely exceeds $21,000, including daily county jail cost estimates and court records documenting the time those arrested spent in jail awaiting court hearings. That figure doesn’t include costs for those who were arrested who have yet to be charged with a crime or who were sentenced to more jail time for their crimes. It also doesn’t incorporate the bill for city police officers pulled from other divisions and in some cases, working overtime, to disperse homeless camps. Mayor Kevin Faulconer and police officials have defended the ramped-up enforcement efforts on 17th Street and elsewhere downtown, saying they were needed to help the city clear homeless camps considered hotbeds for the hepatitis A outbreak. They’ve also pointed to their efforts to offer services to those they’re encountering and to open a temporary homeless campground and three industrial tents to give homeless San Diegans more safe places to go. But homeless San Diegans who were arrested on 17th Street say the arrests and increased police activity have only made their lives more chaotic. Jean Calma, 49, and her boyfriend Rashad Burns, 38, were arrested early on Sept. 23 after police noticed their tent blocking most of the sidewalk. Police say their tent was surrounded by multiple shopping carts filled with property and crates. The couple were among about a dozen people arrested on 17th Street that Saturday morning. When Calma and Burns were released from jail days later, they learned they’d lost nearly all their belongings and that prosecutors weren’t going to pursue charges. They were surprised when they briefly returned to 17th Street. Rattled by the arrest, Calma and Burns decided they couldn’t remain on 17th Street. The Voices of Our City Choir, a group of homeless San Diegans who perform together, cobbled together donations to help the couple stay in a San Ysidro motel for two weeks. They’ve since managed to find temporary places to stay in other parts of the city but remain without a permanent option. Leticia “Lety” Croce, 49, has also found refuge since her Sept. 19 arrest on 17th Street – at least for now. Croce, who has cataracts and glaucoma, spent nearly a week in jail after agreeing to plead guilty to illegal lodging. She also agreed to a probation order to stay away from an expansive area bordered by Market and Commercial streets and 14th to 19th streets, an area that includes 17th Street and many services for homeless San Diegans. Croce’s got a long rap sheet of previous arrests and feared a longer sentence. Croce’s boyfriend, Randall Holmes, 50, who was arrested with her, urged Croce to go to the city-sanctioned safe campground at 20th and B streets after she was released from jail. Holmes, who couldn’t immediately reach Croce after he bailed out of jail that night, worried about the increased police enforcement and Croce’s stay-away order. Croce’s bad knee and other health issues make it difficult for her to quickly move along when police approach. “I can’t just come out of the tent and leave her,” Holmes said. So Croce moved into the campground in October. 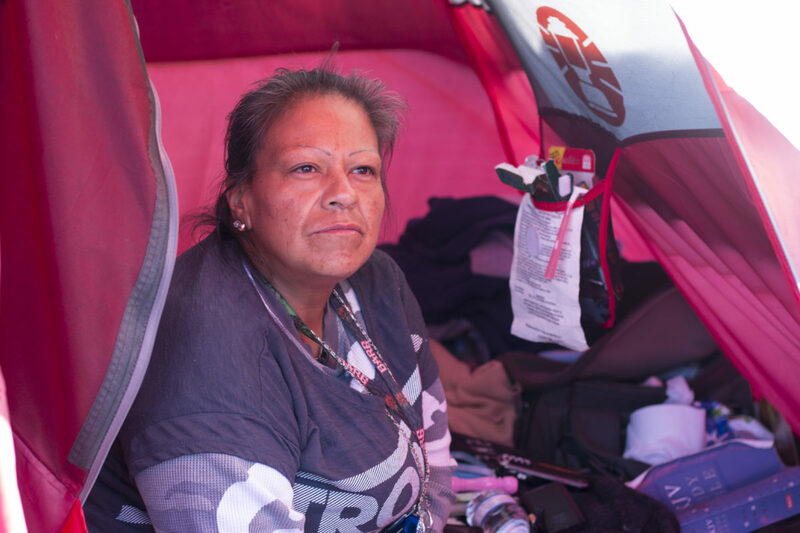 She’s now planning to move to Alpha Project’s tent for homeless adults this month. Yet Holmes has remained on 17th Street despite a stay-away order of his own. He initially tried to fight encroachment and illegal lodging charges prosecutors filed against him but ultimately agreed to a plea agreement that includes the stay-away order. He’s constantly trying to avoid police officers. Lt. Scott Wahl, a police spokesman, acknowledged that increased enforcement on 17th Street and elsewhere downtown isn’t an accident. “We want people to live in a humane, safe, healthy environment for them and a part of that, within our area of responsibility, if you will, is preventing the environment that existed before that allowed (hepatitis A) to spread and kill 20 people,” Wahl said. 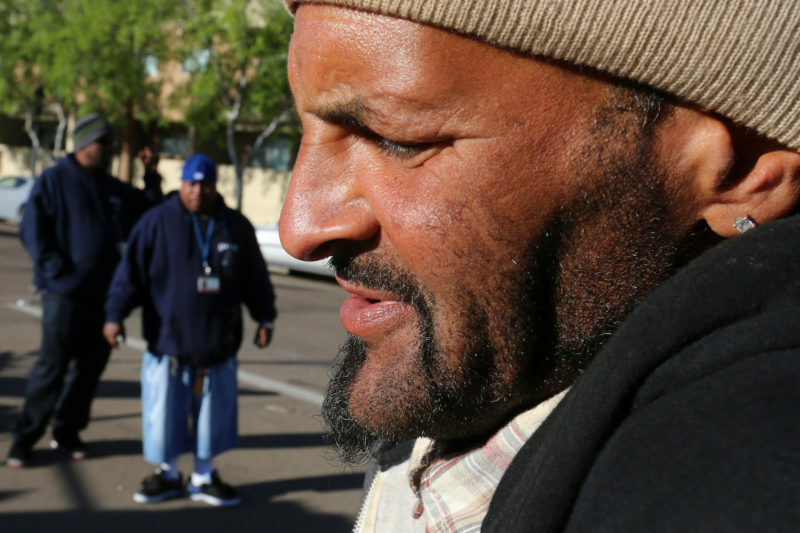 Holmes is one of many homeless San Diegans who have decided to remain in the area around 17th Street despite the police crackdown. After all, it’s an area they know – and an area where they can get help. I found Shawn Watkins, 54, at the Neil Good Day Center on 17th Street despite a new stay-away order barring him from parts of 17th Street and Imperial Avenue. Watkins spent 10 days in jail after reaching a deal with prosecutors after his Sept. 20 arrest. He agreed to plead guilty to an older drug charge. Prosecutors chose not to pursue the encroachment and illegal lodging charges that were the impetus for his September arrest. Watkins, who’s lived on East Village streets for years, said he couldn’t imagine not returning to the neighborhood despite what might come next. He accesses free meals and other services there. “I use the resources that are provided,” Watkins said. But like Holmes, if Watkins gets arrested in the area again, he’ll likely face an additional charge for defying a court order. Watkins said one of his friends who was also arrested in September opted to move to Balboa Park to avoid the hassle. Watkins’ friend isn’t the only one who’s moved into the park, if only temporarily. Balboa Park Conservancy CEO Tomas Herrera-Mishler said in late September he saw the homeless population in the park more than double amid increased police enforcement downtown. Residents in other neighborhoods reported seeing more homeless San Diegans as enforcement increased downtown. Marine veteran Benjamin Brough and girlfriend Tammy Whitt, who were arrested on separate occasions in September, have settled north of 17th Street in Sherman Heights. Whitt said she and others had flocked to 17th Street because police seemed to allow it for a time. They’ve opted to stay nearby to be close to the resources they rely on downtown and Brough’s job as a handyman. Whitt has yet to be charged with a crime, while Brough is fighting drug charges. He said he believes police mistook another person’s meth as his as they rifled through property from multiple tents. A friend bailed them both out of jail after their arrests. Whitt described the arrests as the latest effort by the city to move homeless San Diegans from place to place. Scott Dreher, an attorney who’s battled the city in a series of lawsuits challenging its homelessness enforcement, agreed. He’s followed similar cases for years and said the outcomes of the recent burst of arrests match the patterns he’s been hearing about for years: costly days in jail, stay-away orders and plea deals that do more to displace people and disrupt lives than help them get off the street. Tyrone Wright, 43, who was cited for encroachment on 17th Street on Sept. 27 embodies Dreher’s argument. Wright moved after the citation. He was arrested for illegal lodging and encroachment near 16th Street and Newton Avenue days later. That is the site where Alpha Project opened its homeless tent on Friday. Wright agreed to a deal with prosecutors that came with a new stay-away order. He had to avoid 1500 Newton Ave. with a special exception: He could return when the tent opened. While the enforcement has riled homeless San Diegans, some East Village and Sherman Heights residents cheer it – even as they acknowledge doubts about long-term results. Graciela Paredes and her son Jose, who moved into their home on 17th Street five years ago, said the area’s become more dangerous as homelessness and drug use has boomed and that the increased police activity has made things more bearable recently. They said some neighbors moved away rather than deal with the drugs, violence and other crime in the area. More recently, Graciela Parades said she felt compelled to accompany her daughter on her short walks to school. At one point, Jose Paredes said, a homeless man jumped the family’s fence, stole his puppy and broke into his father’s truck. Two months after police cracked down, the Paredes said 17th Street is less packed with people and tents. Still, on the night I visited last week, a dozen or so tents had already popped up by 6:30 p.m. and a couple dozen people had gathered on the sidewalks. “Cops tell (homeless people) to get away but they come back again,” Jose Paredes said.